"I adapted an old oatmeal raisin cookie recipe I had to match a more autumnal feel, and it turned out really good. 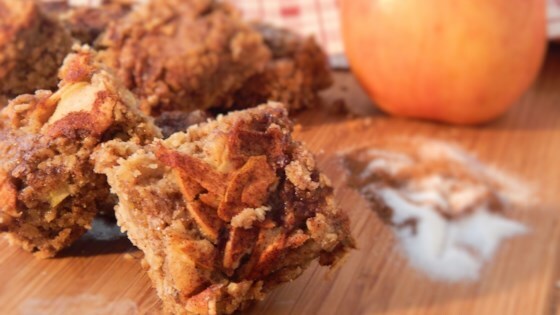 The apples came through nicely and the cookie itself is light, soft, and nicely crumbly." Beat white sugar, brown sugar, eggs, butter, shortening, baking soda, cinnamon, vanilla extract, salt, baking powder, and nutmeg together in a bowl with an electric mixer on medium speed until smooth; stir in oats, apples, and flour until dough is evenly combined. Drop dough by rounded tablespoons, about 2 inches apart, onto baking sheets. Bake in the preheated oven until cookies are lightly browned, 9 to 11 minutes. Transfer cookies to a wire rack to cool, 3 to 5 minutes. For added spice add a dash of apple pie spice, and make sure to not peel the apples. Quick-cooking oats can be used in place of old-fashioned oats. I use the mandolin to thinly slice the apples and then cut them into pieces.